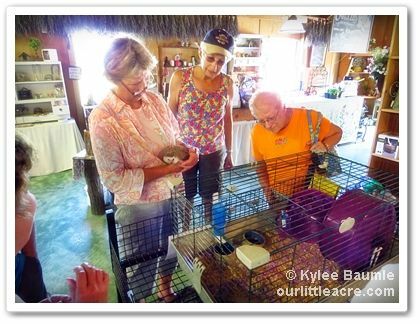 When I first visited Carolee's Herb Farm back in 2009, I'd never met Carolee before and little did I know that it would be the beginning of a friendship that now treasure. We traveled to St. Louis together this past January to attend the National Green Centre event and the best part was the drive there and back, when we shared experiences and ideas as only two garden fanatics can do. 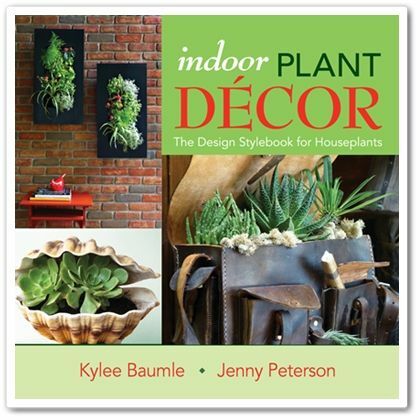 My first book was published in April - Indoor Plant Decor: The Design Stylebook for Houseplants - and Carolee asked if I would come to the farm to talk with her customers about designing with houseplants and do a book signing. I told her I'd be there and today was the day. I got to meet Mrs. Pennyroyal and Marjoram, the hedgehogs! Carolee is an author in her own right, with three books to her credit - Herbal Beginnings, Herbal Choices, and Herbal Passions - a fictional series about Callie and the adventures at Joyful Heart Herb Farm. Autobiographical? Partially, Carolee tells me. In any case, I've thoroughly enjoyed her books and await the fourth in the series, as do many other readers. It's always fun to browse the large gift shop in the barn. The wonderful scent of lavender (her specialty) accompanies you as you take a look at what Carolee found at her last trip to a trade show. She has an extensive supply of fairy garden products, including charming stone houses. Of course she has the plants to go with it all and I'm always amazed at the unusual offerings she has, not just in miniatures, but in perennials in general. Carolee and I share a love of toad lilies (Tricyrtis spp.) and I knew I'd not be able to leave there without adding one to my collection. Today I purchased Tricyrtis hirta 'Moonlight'. I bought some hardneck garlic too, since I'd failed to replant mine last fall. Around 11:00, a small group had assembled to hear me speak about the book that I co-wrote with Jenny Peterson. I shared a little bit of my background, a brief synopsis of what Indoor Plant Decor is all about, and gave a demo of how one plant can take on an entirely different look by merely changing the container you put it in. After fielding several questions, I signed some books for several audience members. 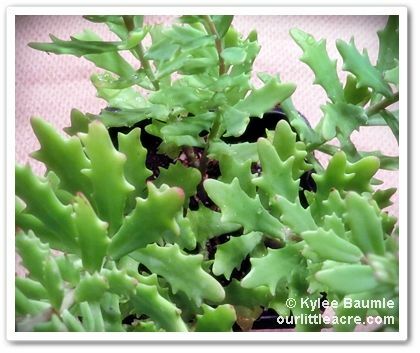 Carolee shares her enthusiasm for succulents. 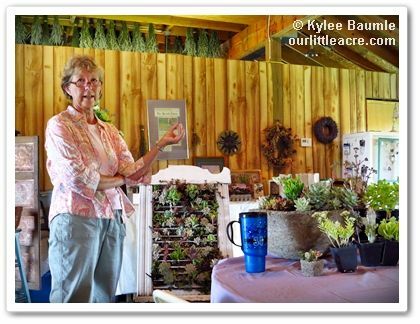 I stayed to listen to Carolee as she spoke in the afternoon about some of my very favorite plants - succulents. After hearing her laud several different varieties I had to purchase Sedum 'Thundercloud' because of its interesting leaf form. It's a smaller, mounding sedum with a scalloped edge. Sedums do extremely well in our clay soil and scoff at hot, dry weather, so I'm never hesitant when buying them. Thank you, Carolee, for having me at the farm. I met some wonderful plant lovers and it's always fun to spend time with you. 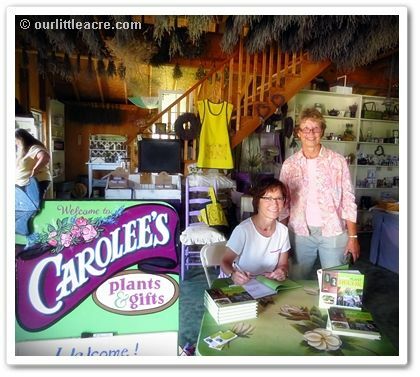 And if any of my readers are in the Hartford City, Indiana, area, be sure to take a side trip to Carolee's Herb Farm. Check the website for hours. Awesome Kylee! I've spoken at Carolee's before too and LOVE HER and her amazing independent garden center. What a great place. My kiddo will be jealous you met the hedgehogs without her!